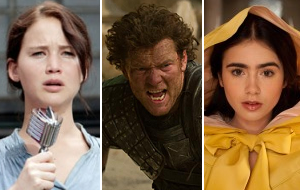 Warner's Wrath of the Titans and Relativity's Mirror Mirror simply won't be able to stop the runaway momentum of Lionsgate's The Hunger Games this coming weekend. After a record breaking start last weekend, The Hunger Games will have no problem remaining at the top of the box office with absolute ease this weekend. The blockbuster franchise starter has been holding up relatively well in its initial days of release, especially given the size of the film's $67.26 million opening day performance on Friday. In addition to the film's early holding power, early word of mouth appears to be quite strong given the film's A rating on CinemaScore. That, along with the fact that The Hunger Games, while having a built-in fanbase, still isn't a sequel, should also aid the film's second weekend hold. At the same time, there are a few additional factors The Hunger Games will have to deal with this weekend in comparison to last weekend. One of the more notable being that the film's one week limited IMAX engagement will be over. This past weekend, IMAX grosses totaled $10.2 million for the film. The film's midnight launch of $19.74 million on Friday and the addition of two new wide releases in the marketplace will also have negative effects on this weekend's percentage hold. While these factors will make it tougher for The Hunger Games to set a new all-time second weekend record (currently held by Avatar with $75.62 million), they won't prevent the film from having a massive second weekend performance in its own right. On Fandango as of 4 p.m. PT, The Hunger Games is currently responsible for a huge 76 percent of daily sales. Look for The Hunger Games to gross $72 million this weekend, which would represent a very reasonable 53 percent slide from last weekend. Two years ago Warner's Clash of the Titans delivered an opening weekend performance of $61.24 million ($63.89 million when including Thursday night pre-midnight preview grosses). While there is interest in follow-up Wrath of the Titans, that interest doesn't appear to be on anywhere near the same level as it was for Clash of the Titans in the days before its release. Wrath of the Titans is off to a lackluster showing on Twitter this week, as it is running roughly 33 percent behind the pace of Clash of the Titans in Twitter activity at the same point in time. That is clearly a poor sign for Wrath of the Titans and the fact that Twitter activity in general is stronger now than it was two years ago makes that sign even worse than it may appear on the surface. The lukewarm reception by moviegoers to Clash of the Titans won't help matters either, nor will the immense competition from The Hunger Games. On the other hand, Wrath of the Titans will receive a boost from higher priced 3D and IMAX admissions. Wrath of the Titans is currently responsible for just 2 percent of daily sales on Fandango. That is a weak number, though to be fair, films aimed at the older fanboy action crowd don't always post strong pre-sales figures. Expect Wrath of the Titans to finish in a distant second place with $37.5 million from an estimated 3,500 locations. Also debuting this weekend is Relativity's Mirror Mirror, the first of two Snow White films hitting theatres in 2012. While the Tarsem Singh directed film starring Julia Roberts and Lily Collins will have its work cut out against The Hunger Games, the film appears poised to have a presence of its own at the box office. Thanks in part to the film's PG rating, Mirror Mirror should appeal to family audiences, especially given that The Lorax isn't the factor now that it was earlier in its run. The film's high-profile concept and the presence of Roberts should also help as well. After a modest start on Monday, Twitter activity has picked up nicely for the film on Tuesday and Wednesday. Mirror Mirror is currently responsible for 4 percent of daily sales on Fandango. That is an encouraging sign given that the figure currently ranks behind only The Hunger Games (albeit very far behind). Look for Mirror Mirror to claim third place this weekend with $24 million from an estimated 3,200 locations. Additional reporting by Phil Contrino and Alex Edghill.